Have a skill that you can teach on camera? Justin Kitch has created a way for you to make a business out of sharing what you know—or to share what you know as a way of marketing your business. Kitch, who sold his paid web-hosting service, Homestead Technologies, to Intuit for $170 million six years ago, raised $7.5 million in venture capital to launch Curious.com last month to “help people who have expertise to create intellectual property they can monetize.” A few hundred thousand visitors have checked it out, and tens of thousands have enrolled in the video lessons, he says. Judging from content already on the site, lessons can be in anything from advanced math to automotive repair, from ballroom dancing to beard trimming, and hundreds of other subjects. One popular Curious lesson series comes from Grow Organic, the online home of Peaceful Valley Farm & Garden Supply. 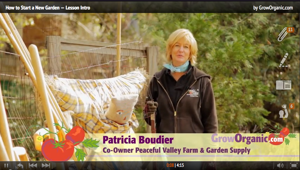 Kitch says proprietor Patricia Boudier hopes to leverage her online lessons in skills like tomato pruning to drive sales online and in her Grass Valley, Calif., store. Another one of Curious’s early stars is Microsoft Excel instructor Guy Badger. Known on YouTube as Motion Training, the gentleman with a charming accent has more than 26,000 subscribers there. But at Curious he has enrolled more than 4,000 subscribers in a month on a more user-friendly platform, with the promise of converting many to paying students. For now, students who sign up and give an email address or Facebook authentication are awarded free Curious Coins they can use to pay course fees. Eventually, Kitch says, when the site hits its stride, real fees will kick in. But Kitch doesn’t consider free massive online open courses like those from Udacity and Coursera to be competition. Few students enrolled in Coursera courses make it past the second week, he says: “They&apos;re in-depth and require commitment. Most people don’t have time for that.” Instead, Curious is offering lifelong learning in a digestible, short, and fun format, he says, adding, “We’re competing more against Angry Birds than Coursera." Kitch says Curious also offers “community based learning,” that allows students to interact with each other and communicate student-to-student. Planning a trip to Paris with a group of old college chums from across the country? Study French together on Curious before you go. Live in Connecticut but want to take ukelele lessons with your niece in Maine this summer? Join a Curious class together. To offer your own expertise on Curious, you’ll need to apply with sample videos. Kitch says his team vetted some 3,000 teachers to choose the 200 that are on the site now. And for bona fide experts who need to develop online instruction skills, Curious also offers lessons on giving lessons. For those, check out Curious Teacher Support.